Tommy Tucker’s career highlight came in 1889, when he hit .372, becoming the first switch-hitter to win a major league batting title. But scant attention was paid to such arcane matters then; he was a household name during his time not because of anything he accomplished on the diamond, but because a nursery rhyme bearing his name (Little Tommy Tucker) had yet to lapse into obscurity. 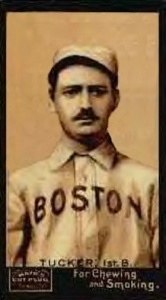 Through the 1892 season, approximately the halfway mark in his career, the right-handed throwing first baseman owned a .297 composite batting average. The increased pitching distance the following year heightened batting averages across the board for the rest of the 1890s. In every case but one, position players at or near the midpoint of fairly lengthy big league careers increased their lifetime BAs after 1892, often by as many as 50 points, as was the case with Ed Delahanty. The lone exception was Tucker, who actually hit 13 points less, or just .284, in the second half of his major league sojourn. He finished at 290. If his hitting decline were not burden enough, he also grew increasingly unpopular among fellow players with each passing year. His nicknames – “Foghorn”, “Noisy Tom” and “Tommy Talker” – provide an initial clue. By the time he took his last throw at first base in a major league game in 1899, few indeed were sorry to see him go. Thomas Joseph Tucker was born in Holyoke, Massachusetts, on October 28, 1863. His parents were Patrick and Mary (née McMannis) Tucker, both of whom were born in Ireland. Tommy was the second of their six children. He was preceded by a sister named Delia and followed by John, Timothy, Rosa, and Joseph. Patrick Tucker, who worked in a cotton mill, died in an accident in 1874. As of the 1880 census, the four oldest children worked in a paper mill while their mother kept house. In all likelihood Tommy, as the eldest male child, went to work at that trade soon after his father’s untimely death and never finished school. Tucker played for a semipro team representing his home town in 1882-83.1 He turned pro in 1884 with the Holyoke entry in the minor league Massachusetts State Association. He began the following season with Springfield of the Southern New England League before moving to Newark of the Eastern League. Returning to Newark in 1886, he hit .281 and was acclaimed the best all-around first baseman in the loop. Baltimore manager Billy Barnie fired weak-hitting Milt Scott (.481 OPS in 137 games in 1886) and replaced him with the fancy-fielding switch-hitter. On November 23, 1886, in Holyoke, Tucker married Theresa Powers (whose parents also both came from Ireland). It’s notable that Tucker’s occupation was still listed as paper worker. In his big-league debut on April 16, 1887, at Baltimore, the 5-foot-11-inch, 165-pound Tucker batted cleanup for the Orioles and went 1-for-3 while swinging from the left side in an 8-3 win over Philadelphia’s vaunted rookie right hander Ed Seward.2 He followed his outstanding rookie season in 1887 by leading the Orioles in home runs and RBIs in 1888, and then topped the American Association in batting in 1889. Baltimore resigned its AA membership that fall and pirated most its players and team colors into the minor league Atlantic Association prior to the 1890 season. Tucker tied himself in knots, according to several items that winter in Sporting Life, and made himself look utterly foolish over whether to jump to the rebel Players League. He finally signed a personal services contract allowing Baltimore to sell him to any team he wanted, and wound up going to the Boston National League entry for $3,000. Shunned by all remaining clubs when the National League lopped off four teams at the close of the 1899 season, Tucker spent 1900 batting a lackluster .277 for Springfield of the Eastern League. Following two more undistinguished seasons in the Connecticut State League, he left the game to work at his original trade in Holyoke paper mills. At the time of his death in a hospital “after a long illness” on October 22, 1935, in Montague, Massachusetts, a town some 30 miles north of Holyoke, his son Raymond was a political journalist in Washington.13 Still, from all accounts, although Tucker had two successful children, and some of his grandchildren are alive today, life for him never had anywhere near the same flavor after he left baseball. Tucker’s .372 mark in 1889 still stands as the season record for a switch-hitter. In addition he is #3 on the all-time hit-by-pitch list and held the record from 1893 to 1901 when Hughie Jennings passed him. An interesting task awaits future researchers: determining whether Tucker hit better from the left or right side of the plate. Most batsmen in the nineteenth century experimented at one time or another during their careers with switch-hitting, but few remained switch-hitters throughout. Tucker stands alone among 19th-century hitters with lengthy careers, not only in that his batting fell off markedly after the pitching distance was lengthened in 1893, but also because he apparently never tried to determine if he might have been better served by batting only from one side of the plate. This biography is an expanded version of one that appeared in David Nemec's "Major League Baseball Profiles: 1871-1900" (Bison Books, 2011) vol. 1. In assembling this biography I made extensive use of the Boston Globe, Sporting Life, The Sporting News, the late David Ball’s groundbreaking nineteenth century Trade Log, David Funk’s blog “All Funked Up” and the Washington Post for details of Tucker’s professional baseball career. His family background came from ancestry.com. 1 New York Clipper , March 29, 1890. 2 Sporting Life, April 27, 1887, 2. 3 Boston Globe, September 22, 1893, 6. In the same game Cincinnati second baseman Bid McPhee wore a glove for the first time in his career. 5 Sporting Life, May 19, 1894, 1; Boston Globe, May 16, 1894, 1; David Funk blog, “All Funked Up,” May 15, 2015. 6 David Nemec and Eric Miklich, Forfeits and Successfully Protested Major League Games (Jefferson, North Carolina: McFarland & Company, 2014), 78. 10 The Sporting News, July 23, 1898, 3. 11 Cincinnati Enquirer, May 24, 1898. 13 Sporting Life, April 27, 1887, 2.